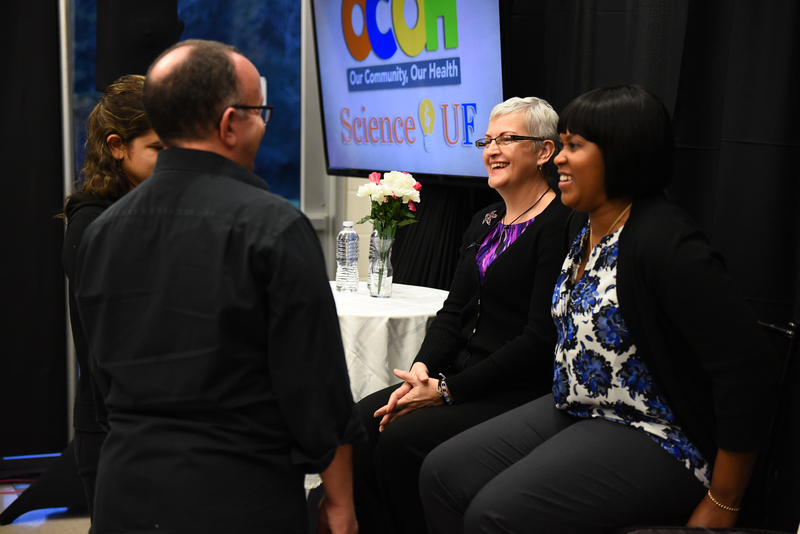 UF HealthStreet, a community engagement program in the UF Department of Epidemiology, is partnering with the UF College of Journalism’s STEM Translational Communication Research program to host Our Community, Our Health (OCOH). OCOH is an informative, interactive and engaging town hall event aimed at opening discussion about health research findings between researchers and community members to assist in the process of translational research. The upcoming February 10th event will discuss colorectal cancer research and is free of charge to anyone interested in attending. A panel made of health providers and community members will discuss the topic and answer questions. Through live-streaming, text messaging, interactive polling and social media, the forums allow open conversations from both a physical audience and people tuning in! Using the hashtag #OCOH, people can ask questions and share comments. Live stream link here: http://www.jou.ufl.edu/tcr/livestream/. Various partnering institutions in the National Institute Of Health Clinical and Translational Science Awards Program will be hosting live stream viewing events across the nation for their local community . Through multi-site collaboration, Our Community, Our Health is transforming how translational science is retained, shared and implemented among various stakeholders across the nation. For event location, times and information about the topic and panelists, please visit here.